Who cares about Greece? Well, let me put this on the table at the start of my thoughts about that country’s current economic woes. I care, and so should a lot of readers ‘out there’. The reasons for the country’s current financial crisis are clear; proof that illegal accounting practices were permitted to hide the countries complex financial issues; an economy in a social democracy where trade unions resist real wage cuts intended to help shore up the countries economy; since the Greek state was founded in 1830 it has been in what the economists call “sovereign default” nearly every other year – what the World Bank and the International Monetary Fund call “serious default”. I recently stood on the ground at Thermopylae and tried to imagine King Leonidas of Sparta leading his army of but 300 against the vast Persian forces of King Xerxes. The battle that took place there, recently honored in a movie called simply “300”, was in 480 BC. The fight raged for days. The Persian Army sustained tremendous losses, brought on by the indomitable spirit of Greece’s finest soldiers. It is fitting to compare that ancient event with what Greece faces today. This is not a culture, nor a people, known to just lie around and complain about the way things are. Certainly there have been demonstrations in Athens; when financial crisis and changes in government promises collide, the people in a democracy have the right to rise up and disagree. Keep in mind that it was the Greek form of government that was the foundation upon which western democracies were founded. Greece’s current Prime Minister, George Papandreou (junior), has been faced with making extremely difficult austerity moves. The International Monetary Fund and the leaders of the European Union are at odds about what needs to be done in the face of this mounting crisis. The vitality of the Euro and the European Union are at risk. If Greece defaults, Spain and Portugal could very well follow. If doomsday economic psychics’ predictions that such events will occur come true, then what will happen to the goal of making the European Union a world leading economic engine? Such are the challenges facing Greece and Europe. The view today across the narrow strip of land between the Trachinian Cliffs and the Malian Gulf has changed a great deal since the Battle of Thermopylae. A superhighway now makes a long sweeping curve along what was the beach at the time of the battle, over 2,490 years ago. That conflict’s lessons remain vital to this day; don’t underestimate the less favored; sometimes leaving things as they are is the worst thing to do; be responsible and resourceful in facing what seem to be insurmountable odds. Even in light of these challenges, there is a Greece generations of travelers have come to know. 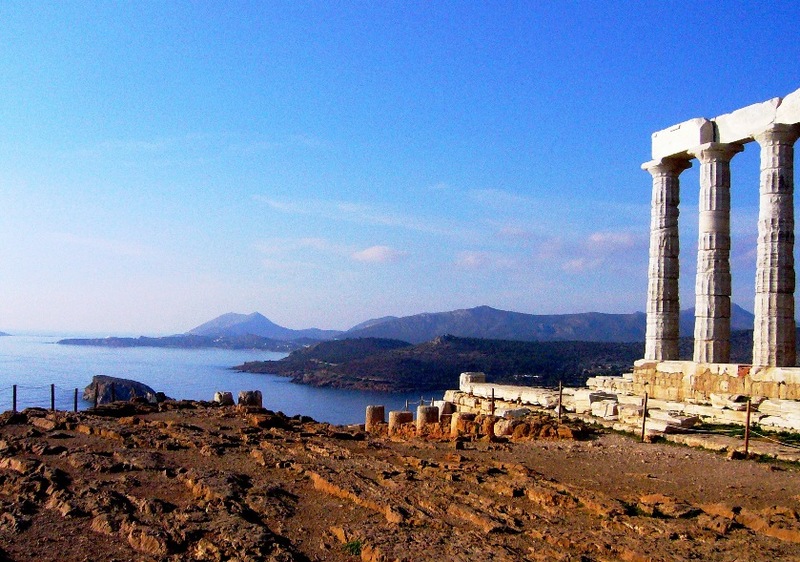 The road southeast out of Athens takes visitors along the Aegean Sea to the Sounion Peninsula. On the highest point, and at the very end of the peninsula, are the ruins of the Temple of Poseidon, a site never forgotten. As travelers explore the rocky heartland northwest of the capital city, they discover the monastery of Hosios Loukas, where the remains of St. Luke are buried. The buildings contain some of the most gorgeous and well preserved mid-Byzantine art in the world. Further along the road from the monastery is the city of Delphi, where the Oracle was located in ancient Greece. Some of the ruins at the site date as far back as 1600 BC, though the majority of the structures date to a time of greatest activity some 1,000 years later. After crossing the bridge to Patras at the entrance to the Gulf of Corinth, travelers head south to the city of Olympia, site of the ancient Olympic Games. Temples and ruins of the ancient city abound. Traveling east, intrepid visitors view Mycenae, a city dating to the second millennium BC. Outside the wall of the city is the tomb of Clytemnestra. Her husband, King Agamemnon, lead the Greeks to victory against Troy. The Saronic Gulf, viewed from the high ground of Mycenae, beckons with promises of the cerulean blue wash of the Aegean Sea against Greek’s famed islands. Always the city of Athens beckons, the capital of a rugged and treasured country. And what has all of this to do with Greece’s current situation and whether we should care? We can trace the roots of our democracy, our art and architecture, our understanding of military and naval tactics and our gift of recording the written word to Greece. The ancients created a Mythology which cataloged and described our deepest human nature, good and bad. As Joseph Campbell, author of The Power of Myth, so eloquently said, “Myths are our public dreams, dreams are our private myths.” The history of the ancients’ forms the foundation of the modern and for us to not care about Greece is tantamount to saying that we don’t care about history at all . . . and that just can’t be true. Cars and trucks, every day, pass over the remains of the dead at Thermopylae. Were it not for those who created, built, dreamed and sacrificed we would have no Greece at all. So, Greece will heal and this crisis will pass. Those of us who share time traveling across Greece have come to understand the profound and unforgettable lessons of that land. Mark Gordon Smith is the author of several travel memoires about Italy. His first novel, Harrisville, was released in 2009. He is the owner of Private Italy Tours, offering small group tours across Italy and Greece. Visit his web site at www.privateitalytoursltd.com.